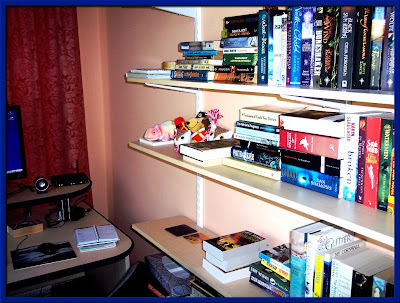 Scene of the Blog Featuring Cath of read_warbler! Cath's reading preferences are wide-ranging: crime, fantasy, SciFi, Horror, YA, Victorian ghost stories, classic lit, and non-fiction such as travel books, history and biographies. If you've never visited Cath at read_warbler, you're in for a treat. Please take the time to pay her a visit, and don't forget to say hello while you're there! If you're visiting from Cath's blog-- Welcome! I'm glad you stopped by to take a look at where all read_warbler's magic happens. If you'd like to see any of the photos in a larger size, all you have to do is click on them, and they'll open in new windows. If you'd like to check out previous participants' blogging spaces, click on the Scene of the Blog tab at the very top of my header. There are two ways to search: by Blog Name and by Location. I think of my little study, where my pc is, as my sanctuary. Okay it's quite small, only about 12 ft by 6, but into that little space I've fitted quite a large modern desk, a run of seven long bookshelves and a small stand-alone book-case. This little space is where I do my blogging and where I'm in touch with all the online friends I've made all over the world, mostly via blogging, but other things as well. Years ago the way I did that was via pen-palling - now there are no envelopes through the door with pretty stamps on *but* communication is more instant and, for me personally, more interesting. I like to be surrounded by my 'stuff' so, as well as my pc on that shelf, there's a pretty blue paper-weight my husband gave me as a Christmas present not long after we were married, a little wooden box I keep foreign stamps in, a book-mark of a cardinal also given to me by my husband, a painted stone with a scene of St. Michael's Mount near Penzance in Cornwall, where I come from and, on the other side - Vivian, a painted stone of a ginger cat, named after the late ginger cat of a close American friend. The scene on my pc is of a painting I saw a few days ago in Cardiff museum and fell in love with. It's called Forest Cove, Cardigan Bay (in Wales) by John Brett. To the right of my pc is the start of my bookshelves, starting with more stuffed cuties: Hong-Kong Phooey, the owls were made for me by a lovely friend met through book blogging, the cardinal bought in the US (I do seem to have a 'cardinal' thing going on, don't I?) and so on. The books you can see here are mostly books for reading challenges I'm doing this year - chunksters, WW1 themed, fantasy for the Once Upon a Time VI spring challenge, sci-fi. There are a lot more books you can't see, basically I use my study to keep the books I love the most in. That's not to say I don't love the rest of my hundreds of books all around the house... I just like these a tiny bit more. This is the left-hand side of my desk. More stuff. I love notebooks so on the end is my hard-copy of the books I read throughout each year. Underneath, a notebook keeping the list of books I've read and will read for my personal American challenge. Under my glasses case, a notebook full of loads of books I've seen around the blogging world that I've checked out and decided I want to read one day (when I win the lottery). Next to that, a little black book of books to look for in libraries - not just my own local one but any I 'happen' to visit. The photo is of myself and my two daughters and grand-daughter at my youngest daughter's wedding ten years ago. Back then we lived elsewhere and that was our garden then. Thank you so much to Cathy for giving me the opportunity to feature on her blog. I feel very honoured and not really worthy, but have greatly enjoyed the visit. Cath, it's always a thrill for me when I'm able to feature a book blogger whose blog I enjoy so much! I, too, have a room of my own that looks out over the back garden, and in many ways it's my favorite area of the house. I, too, used to have snail mail penpals, and I also prefer the speed of email now. And your desk! It's wonderful to have a nice, large desk, isn't it? The greenhouse you have reminds me of the one my husband built in Hertfordshire. Many years have passed since he put it together, but it's stood the test of time. And that "thing" you have for cardinals? They're such pretty, cheery birds. They're quite common where I grew up, but they tend to live out in sparsely populated areas here in the Sonoran Desert. It's always a thrill when I hear and spot one flashing through the trees. Thank you so much for allowing us this glimpse into your life and into your home. All of us appreciate it so much! I don't know Cath's blog - but will visit imminently! What a great space to blog and have all your books nearby! 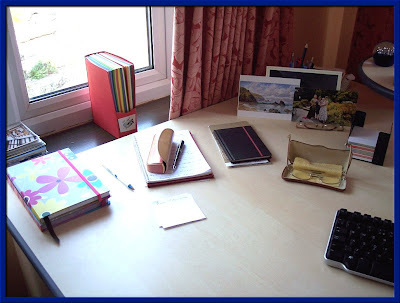 I blog mainly on the sofa and at the dining table and would love a little corner just for me. you couldn't have guested a nicer person! Thank you. My husband works hard in the garden - I'm more of a fair weather sort of gardener. 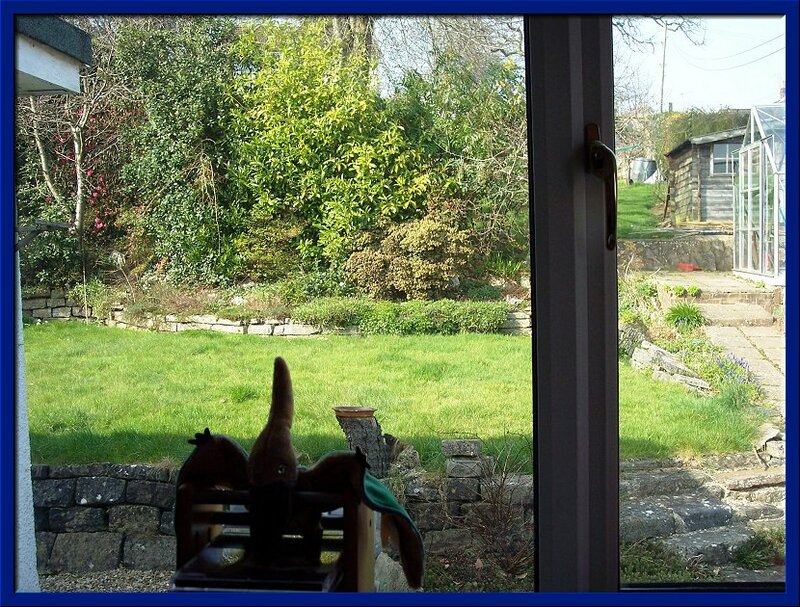 I love the view from the study window! So relaxing. wow, there is empty space on those bookshelves! Kay: I had no idea that you'd gone before me as we were away last week. So nice to see 'your blogging space' too. I think you were one of the first bloggers I got to know when I started about 5 years ago. You and Nan. So many lovely friends I've made this way. Anna: It's very relaxing, this is where I come to get some *me* time. Caite: Not any more... I bought new books over the last couple of weeks. LOL. Cath's study sounds like a little slice of heaven! bermudaonion: That's exactly the way I would describe it - 'my little slice of heaven'. 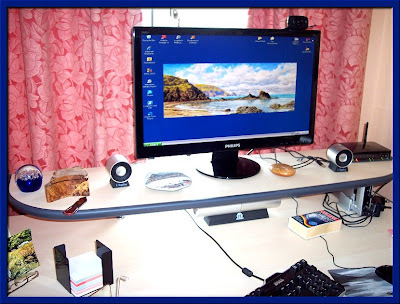 Elizabeth: I didn't want to change from my square monitor to this new widescreen one but my husband saw it on Amazon and said it was a huge bargain. So I bought it and wasn't really that crazy about it as it elongates pages. I'm more used to it now, but I'll be honest, I prefer my old one. Wonderful spaces Cath! I'm on my way over to check out your blog. What a wonderful space and insight into where you do your blogging, Cath, and what a fabulous view. You are far more organized than I am, which gives me pause to clean up my act. Off I go . . .
Peggy: Thank you. And for your comment on my blog... will check your blog out in a moment. Penny: Yes, I do enjoy my side view over the garden. I see all kinds of wild-life and it's just lovely. I have organised clutter. I like my clutter but I have to keep it tidy or I would go nuts. LOL. Nan: Glad you enjoyed seeing my blogging space. I wasn't sure about doing it either, like you, a bit shy I think. But it was fun and I would love to see where you blog. As well liked and respected as Nan is in the community, there are many people who'd love to see where she blogs.